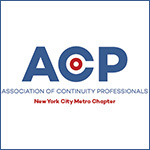 The ACP New York City Metro Chapter currently has four available board positions. The positions include Program Director, Education Director, Membership Director, and Treasurer. All chapter members are encouraged to vote. Cast your ballot here. Additionally, those who are interested running for the open board positions should reply to nycmetro@acp-chapters.com. The chapter has also announced that its annual holiday luncheon will take place on December 12, 2018 at Ruth Chris Steakhouse in midtown Manhattan. Chapter member can register to attend here.